In my last class, we shared about our biggest fears and got ourselves prepared to try handstands. It was SO beautiful how EVERYONE tried them. We are truly in this together. 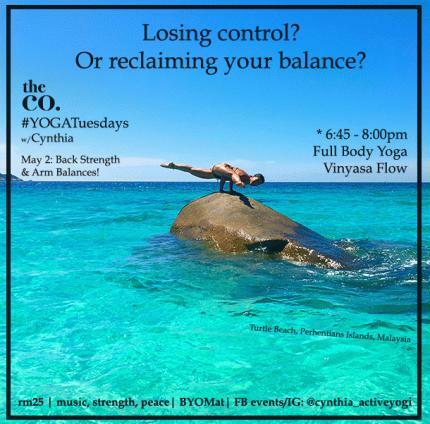 This Tuesday, May 2nd at 6:45pm - we will be work up towards finding balance on our hands. For me, arm balances only came once I achieved some back strength and stability. Back strength - via downdogs, chaturangas, heart openers, flows, etc.- had SO much impact on the rest of my day and life - confidence, support, attitude, meeting others, laptopping, traveling, etc. Build back support, find your foundation, open your heart, be more approachable, embrace and step into who you want to be. In Tuesday's Full Body Yoga, 6:45-8pm, we’ll weave breath and yoga poses into a flow to the tempo of chill music, unwinding any tension and soreness from our day. I unexpectedly was away for 6 weeks, so this class's playlist will consist of songs that have inspired me from my latest travels to Bali, Tokyo, Hong Kong, and Perhentians Islands. Expect a moving focus on all parts of our body - arms, back, heart openers, twists, core, legs - as we release tension, build strength, increase flexibility, and instill a softness to go about our life with more ease. Who needs a massage when you have yoga? SERIOUSLY - yoga is like a massage for me! 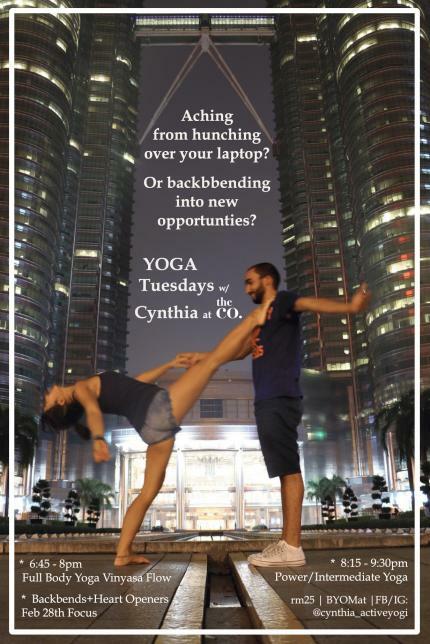 Modifications for all levels offered, ending with a touch of yogic philosophy to take with you into the rest of your evening. 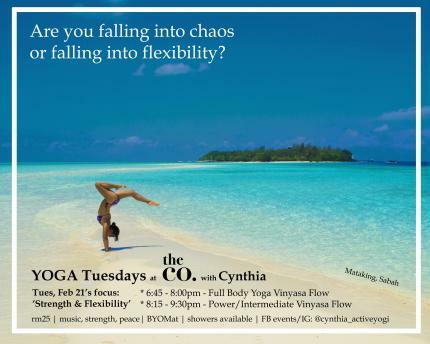 We'll weave in twists, arm balances, inversions, and/or partner yoga - with modifications given for all yoga levels. Rather than just learning how to strike a pose for the camera, we’ll break them down, learn about its benefits, and how to work them into your yoga flows. * Can't make 6:45pm? Come by 7pm latest and hop in. Transitioning from the tech startup space, Cynthiã Wõng's aware how hard entrepreneurs, startups, and anyone in a company often work towards their goals. She’s also well aware what that can mean for the body to sit at a computer, laptop, or even stand in the same position for hours, and the mind to be always 'on' 24/7. She's currently on a mission to create 1 million inspired moments to empower people all over the world. She sees yoga as a transformative tool for people to connect again to oneself, to step into the person they’ve always wanted to be. 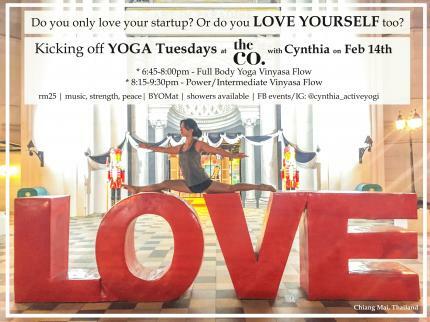 She integrates breath, environment, music, and fun to build conscious communities, together embracing yoga, as well as personal goals and visions. 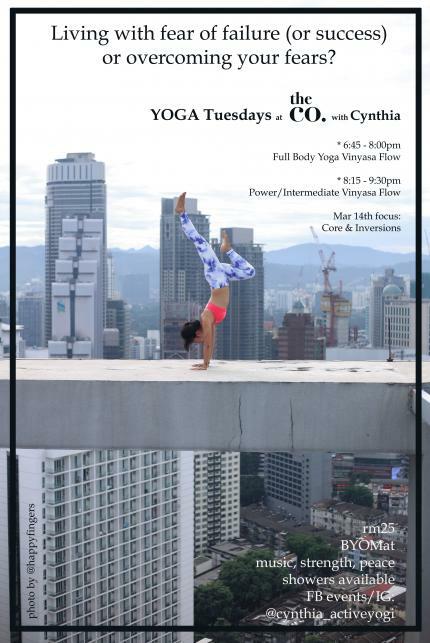 She continues to expand her yoga class offerings to include elements she’s passionate about - in this case, yoga in Bangsar at a beautiful co-working space, that’s accessible to entrepreneurs, startups, and the LRT! While born and raised in US, Cynthia has lived in 8 countries and traveled 56. She’s spent most of the past nearly 5 years based in KL. She’s taught yoga for various groups – transformational programs for women, yoga for families, couples, new moms, refugee girls and women, male pageant finalists, at MURFEST, even designing a series of yoga classes for running. Venues expand beyond beautiful studios to include candlelit balconies, city center rooftops, seaside beaches, eco-resorts, desert festivals, urban parks with skyline view, cafes, and her weekly Sunday sunset yoga classes under a huge open air dome. Cynthia believes through connecting with each other as well as the sights, sounds, and space, we can surrender to the magic all around us to become truly inspired and powered by our light within.